Just Who Is Not A Kafir? Home » Magazine » International » Just Who Is Not A Kafir? Amir Mir	July 19, 2010 00:00 IST Just Who Is Not A Kafir? Most Sunnis adhere to the Hanafi school of jurisprudence. Only 5 per cent of the country’s population belongs to the Ahle Hadith sect or Wahabis. When two suicide bombers exploded themselves in the shrine of the revered Sufi saint Hazrat Data Ganj Baksh in Lahore, the ensuing devastation—in which at least 50 people were killed and scores injured—rendered meaningless the promise of Pakistan founder Mohammed Ali Jinnah to the Constituent Assembly on August 11, 1947. Jinnah had said, “You may belong to any religion or caste or creed...that has nothing to do with the business of the state. You are free, free to go to your temples; you are free to go to your mosques or to any other place of worship in this state of Pakistan.” These stirring words were then perceived as an explicit assurance to the religious minorities of their rights in a country where Muslims constitute over 95 per cent of the population. 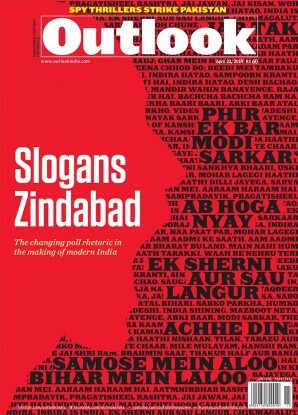 Six decades later, as Pakistan remains trapped in the vortex of violence, even the Muslims are in desperate need of assurances such as Jinnah’s. Mosques and shrines of saints are targeted regularly, votaries of different Muslim sects are subjected to suicide bombings, and just about every mullah seems to enjoy the right of declaring anyone who he thinks has deviated from Islam an apostate, a non-Muslim, whose killing is religiously justifiable. In the darkness enveloping Pakistan, it won’t be wrong to ask: who isn’t a kafir or infidel, beyond even the religious minorities of Christians, Sikhs and Hindus? Shrapnel from every explosion strains the social fabric, tears its rich tapestry, and undermines the traditional forms of devotion inherited over generations. Take the twin suicide bombings of the Data Ganj Baksh shrine of July 1, which has been blamed on the Tehrik-e-Taliban Pakistan (TTP) even though it has vehemently denied its involvement. This Sufi shrine defines the spirit of Lahore, which is often called Data ki nagri (Data’s abode). Here lies buried Syed Abul Hassan Ali Hajvery, popularly known as Hazrat Data Ganj Baksh, whose shrine is mostly visited by members of the Barelvi sect of Sunni Muslims. The shrine, famous for mystical dancing by devotees, is a Lahore landmark. However, the adherents of the Deobandi school of thought, to which the Taliban belongs, are opposed to the idea of Muslims visiting Sufi shrines and offering prayers, a practice known as piri-faqiri. The Deobandis deem piri-faqiri to be heretical, a gross violation of Islamic doctrine; ditto mystical dancing. The Deobandis, therefore, consider the Barelvis as kafir whose neck can be put to sword, no question asked. This isn’t the first time Barelvi Muslims have been targeted. On April 12, 2006, for instance, a Barelvi conference organised to celebrate the perfectly orthodox occasion of Prophet Mohammed’s birthday at Nishtar Park, Karachi, witnessed a suicide bombing that claimed 70 lives. 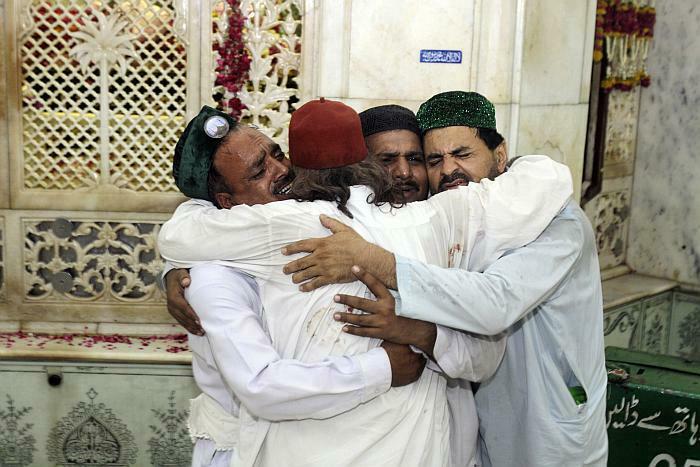 Last year, the Taliban attacked the shrine of the 17th century Sufi saint-poet, Rehman Baba, who is said to have withdrawn from the world and promised his followers that if they emulate him, they too could move towards a direct experience of god. He also believed god could be reached through music, poetry and dance. But then music and dance are unacceptable to the Deobandis, and the Taliban extensively damaged the shrine of Rehman Baba with explosives. 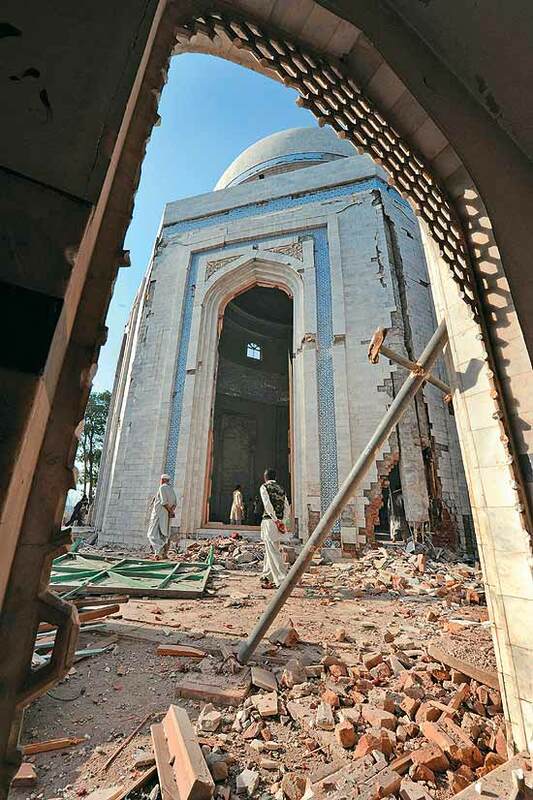 Soon, they used rockets to ravage the mausoleum of Bahadar Baba, and then directed their wrath against the 400-year-old shrine of another Sufi saint, Abu Saeed Baba, both located near Peshawar. In a way, a minority of Pakistan’s population has taken to declaring the rest as kafir. Look at the figures—95 per cent of the Pakistani population are Muslim, of which 85 per cent are Sunni and 15 per cent Shia. But for the five per cent belonging to the Ahle Hadith (Wahabis), the Sunnis prescribe to the Hanafi school of jurisprudence. They are further subdivided into the Barelvi and Deobandi schools. Most agree on the following composition of Pakistan’s population—60 per cent Barelvis, 15 per cent Deobandis, 15 per cent Shias, 5 per cent Ahle Hadith, and the remaining 5 per cent constituting Ahmadis, Ismailis, Hindus, Sikhs, Christians, Buddhists, Parsis, etc. This means only 20 per cent of Pakistanis (15 per cent of Deobandis plus 5 per cent of Ahle Hadith) strictly consider the remaining 80 per cent as kafir, even willing to subject them to death and destruction. It was the Deobandi-Wahabi alliance, says Rehman, which pressured President Gen Zia-ul-Haq to declare the Ahmadis as non-Muslims. At a stroke of the pen, thus, a Muslim sect was clubbed with other religious minorities. Under the Constitution, they can’t call themselves Muslim or even describe their place of worship as a mosque. 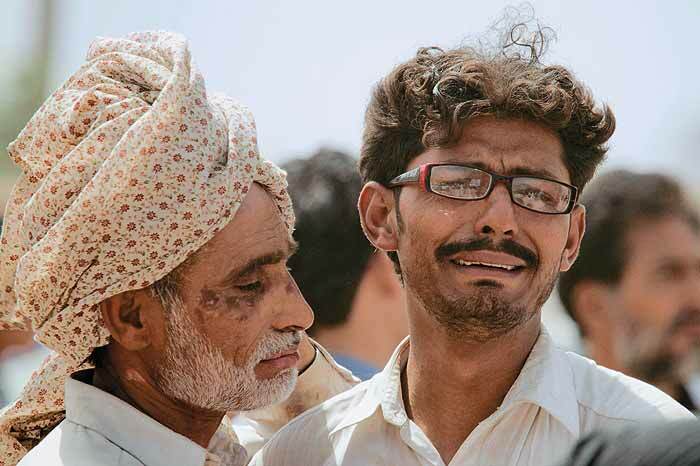 Wary of disclosing their identity publicly, the Ahmadis were dragged into the spotlight following devastating attacks on two of their mosques in Lahore that killed over a hundred people. But ‘Muslim’ status doesn’t insulate even mainstream sects from murderous attacks. Ask the Shias, whose Muharram procession in Karachi was bombed in December 2009, killing 33. The Deobandis regard Shias as kafir, claiming their devotion to the clerics and grant of divinely inspired status to them as heretical. The history of Sunni-Shia conflict is as old as Islam, but this has become increasingly bloody in the last decade—over 5,000 people have been killed since 2000—because of the war in Afghanistan. Since Iran had backed the Northern Alliance there, the Deobandis have taken to retaliating against the sect in Pakistan. They also accuse the Shias of assisting the Americans to invade Iraq. Says historian Dr Mubarak Ali, “One consequence of the war in Afghanistan is the fracturing of Pakistan’s religious patchwork quilt. Whereas once the faultlines lay between the Shias and Sunnis, these have now spread to the Barelvis and Deobandis, who are both Sunni.” Since the Barelvis are moderate and against the Taliban, the Deobandis look upon them as the state’s stooges, who as heretics should be put to death anyway, Ali argues. Perhaps the complicity between the state and the Deobandis deterred the latter from targeting the Barelvis till now. Lawyer and columnist Yasser Latif Hamdani says, “There is this potent mixture of Pashtun nationalism and Deobandi Islam. Somehow, there is something intrinsic to the very nature of Deobandi doctrine which the Pakistani military establishment is promoting to advance its so-called geostrategic agenda.” Yet, simultaneously, under US pressure, the state had to crack down on the TTP, which, in pique, has taken to wreaking vengeance on the hapless Barelvis. As long as powerful sections in the establishment persist with their goal of bringing the Pashtun Taliban back to power in Kabul, they will continue, says columnist Imtiaz Alam, “digging the grave of a democratic Pakistan”. Sectarianism and jehadi terrorism will be its consequent wages, he insists. No doubt, the enraged people of Lahore took to the streets protesting against the attack on the Data Darbar, but what’s of greater urgency is that the state must do some really deep thinking.